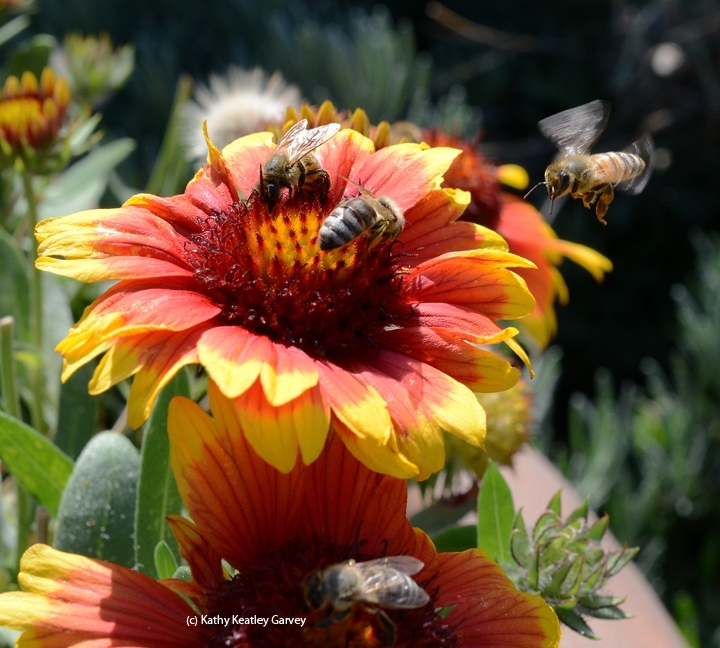 Do Honey Bees Have Taste Buds? 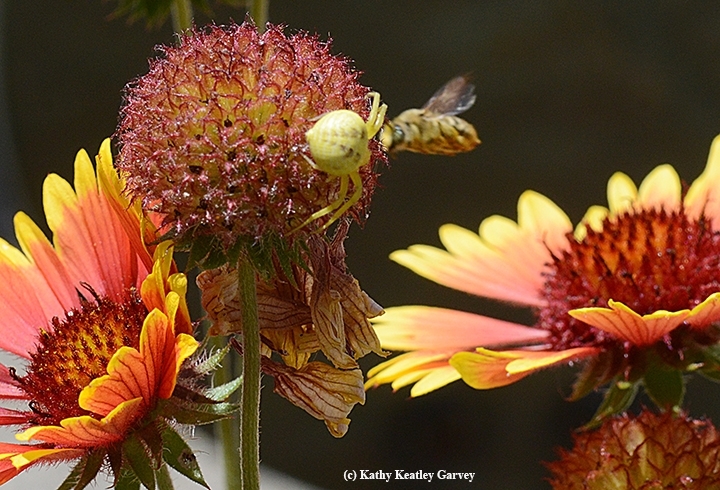 You've seen honey bees nectaring on flowers. You've watched their proboscis (tongue) probing for nectar. Some linger quite awhile before they buzz off. Have you ever thought about this: Do they have taste buds? A colleague asked that question. In fact, it was his friend's nine-year-old son who asked: "Do bees have taste buds, and if so where?" "No," says Extension apiculturist emeritus Eric Mussen of the UC Davis Department of Entomology and Nematology, who retired in 2014 after 38 years of service. That's the short answer. But wait, there's more. "Honey bees, and other insects do not have taste buds, as such," Mussen said. "They have specialized, enlarged hairs; chaetic and basiconic sensillae; that protrude from the cuticle (exoskeleton). 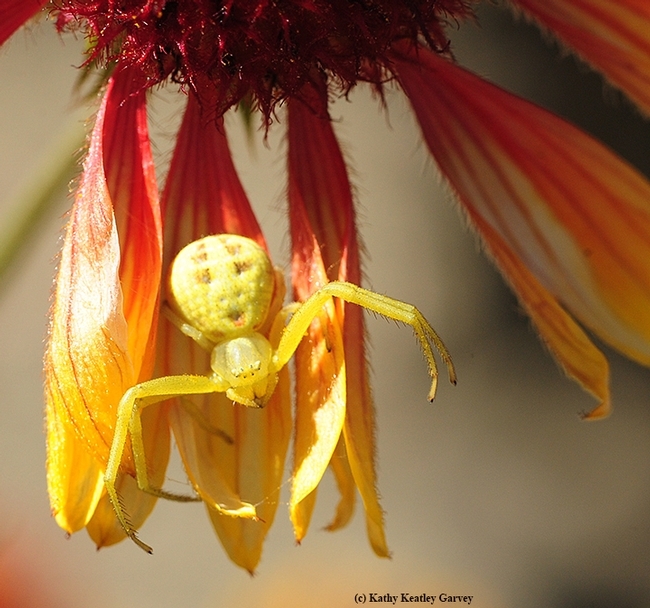 The sensillae have gustatory receptor cells in them that sense the chemicals that are contacted by the tips of the antennae, the mouthparts, or the tarsi (feet) of the front legs. The interpretation of the chemicals takes place in the subesophageal ganglion of the bee, not in the brain. The esophageal ganglion is a very large nerve cell cluster attached beneath the brain." It's good to see youngsters so interested in insects! 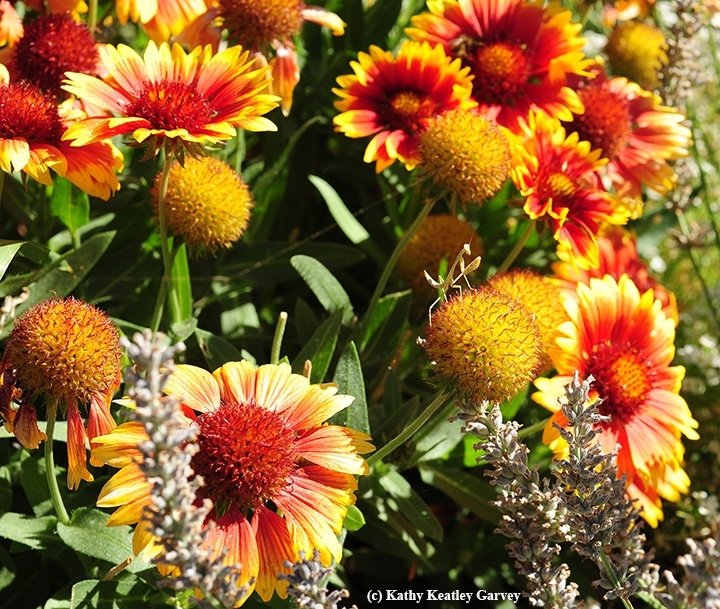 It's early evening and the bees are all over the blanket flower (Gaillardia). But wait, if you look closely, you'll see a tiny sticklike figure on top of a seed head. It's a predator on top his world, scanning the view, feeling the buzz and looking for dinner. 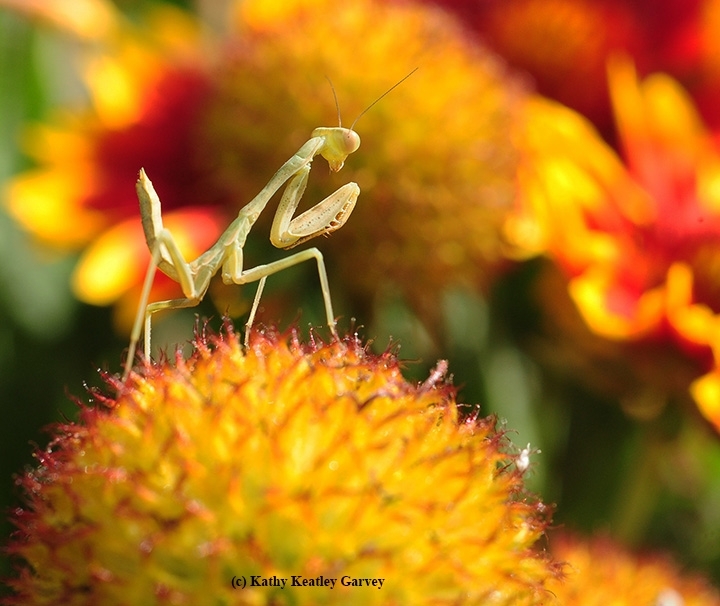 The praying mantis looks too diminutive to catch a honey bee. Too minuscular. Too puny. Too much of a pint-sized predator. Maybe it should set its sights on a fruit fly or a knat. We see you, praying mantis! Come on out, with your hands up! Will my spiked forelegs do? He leaps off the seed head like a frog jumping off a lily pad, but instead of a kersplash, it's a kerplop. 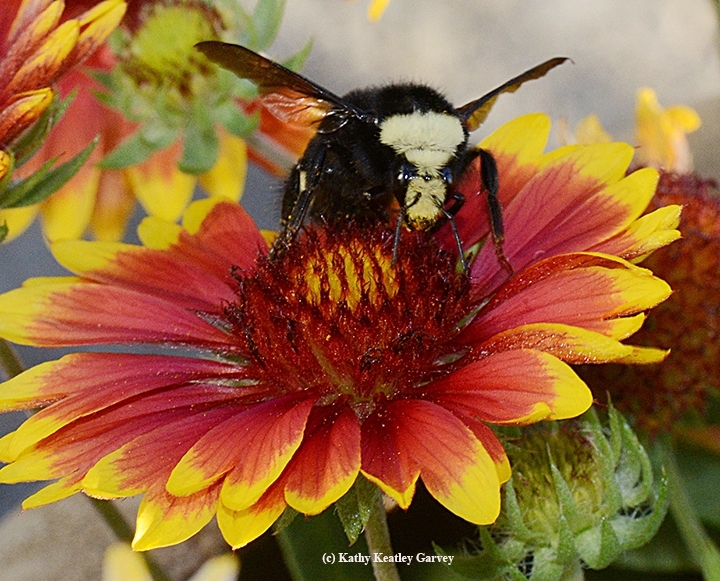 What's Better than Sighting a Bumble Bee? What's better than sighting a yellow-faced bumble bee, Bombus vosnesenskii? Well, a newly emerged Bombus vosnesenskii queen. 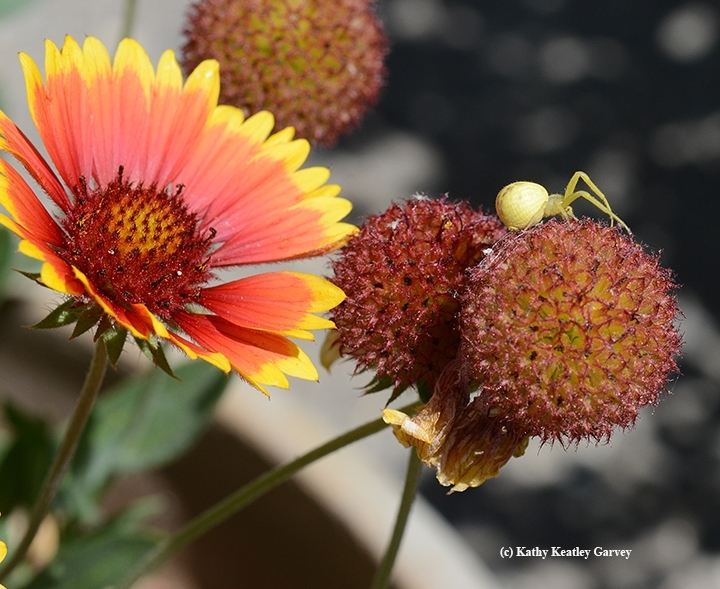 On the last day of June, we spotted this fresh queen-looking foraging on our blanket flower (Gaillardia). Her jet-black color, sunny yellow markings, and untattered wings indicated that this was one of her first flights. 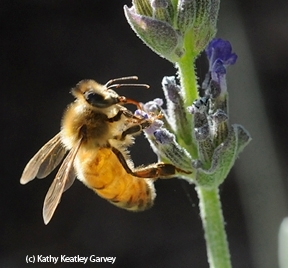 Queen bees are huge--about 18 to 21mm long--much larger than the other bees in her colony. Workers (females) range from 8 to 17 mm while males measure between 10 and 15mm. 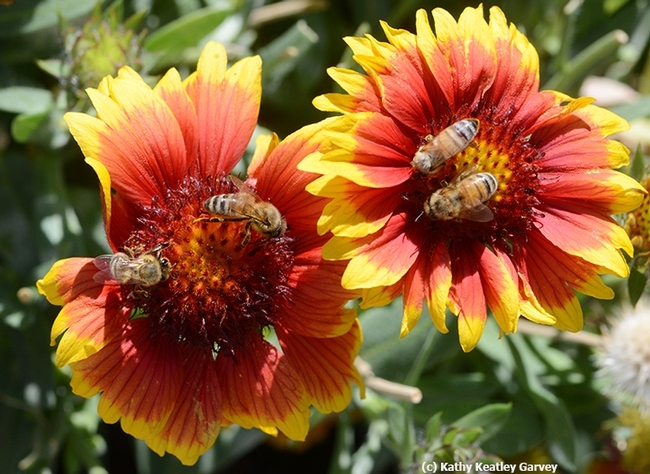 The queen took a liking to the blanket flower, buzzing from blossom to blossom and sharing communal meals--sweet nectar--with honey bees, longhorned bees, and carpenter bees. 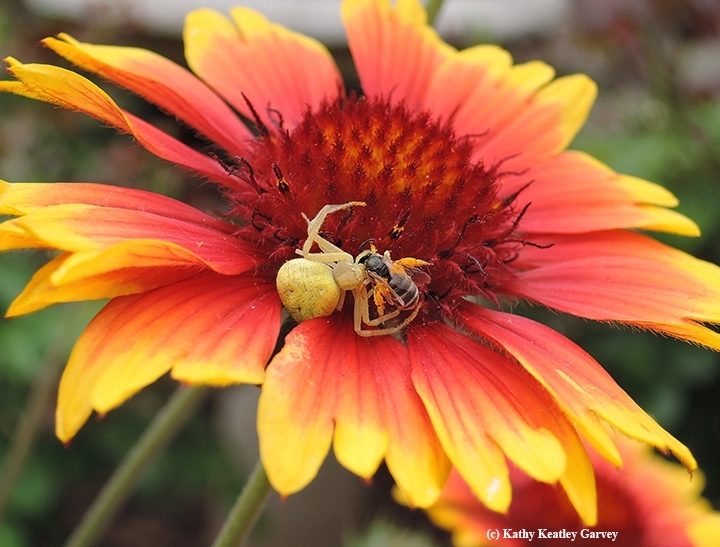 A camouflaged crab spider, sprawled out on the top of a blossom, itched to get in on the feeding action by snagging an inattentive bee, but the bees buzzed right past their would-be predator. Not today! 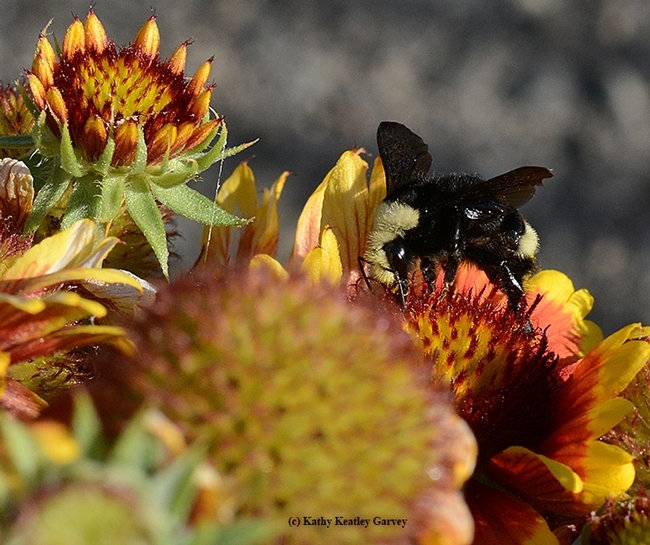 Bombus vosnesenskii is one of only 250 species in the genus Bombus, which is Latin for "buzzing." 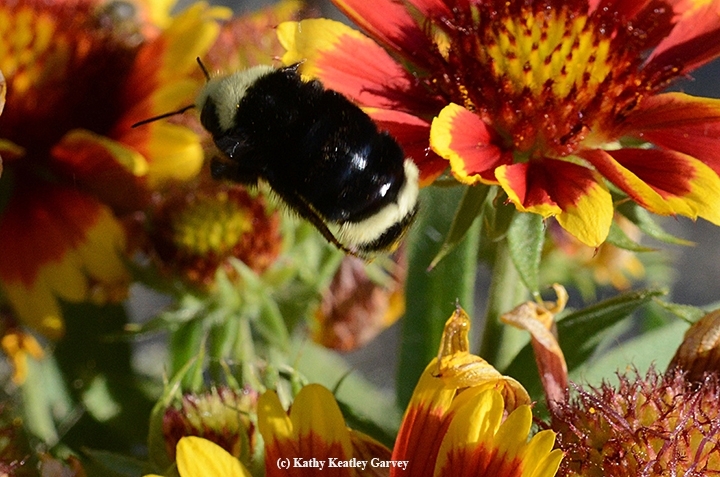 Native to the west coast of North America, Bombus vosnesenskii is considered the most abundant bumble bee from British Columbia to Baja California. Its importance to agriculture is crucial: it's commonly invited to pollinate commercial greenhouse tomatoes, which it does very well. The next time you eat a greenhouse tomato, you should probably thank Bombus vosnesenskii. Want to learn more about bumble bees? Native pollinator specialist Robbin Thorp, distinguished emeritus professor of entomology at the University of California, Davis, is the co-author of the landmark Bumble Bees of North America: An Identification Guide (with co-authors Paul H. Williams, Leif L. Richardson and Sheila R. Colla), published by Princeton University Press. It's the winner of a 2015 Outstanding Reference Sources Award, Reference and User Services Association, American Library Association. Want to hear a bumble bee buzz? Just click this link: Bumble Bees of North America: An Identification Guide. It's almost like bee-ing there.